A Conversation with Drs. Kimani Paul-Emile and Alicia Fernandez. Please join us for a critical and engaging discussion regarding one of the most significant challenges currently facing healthcare providers. 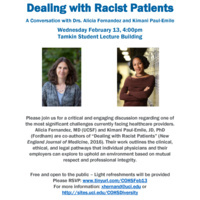 Alicia Fernandez, MD (UCSF) and Kimani Paul-Emile, JD, PhD (Fordham) are co-authors of “Dealing with Racist Patients”. Their work outlines the clinical, ethical, and legal pathways that individual physicians and their employers can explore to uphold an environment based on mutual respect and professional integrity.